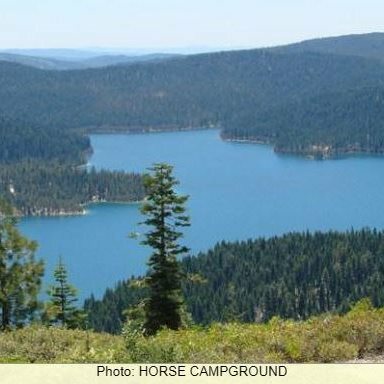 Horse Camp is located on the eastern shore of the Little Grass Valley Reservoir, giving visitors ample opportunity to fish, swim, boat and enjoy nature. The camp is one of eight campgrounds in the area, but the only one equipped to handle equestrian campers. It provides access to a beautiful, adjacent mountain lake and various hiking, mountain biking and horseback riding trails that meander through the scenic hills and valleys. The campground is located in the Northern Sierra Nevada Mountains, in northern California, at an elevation of about 5,060 feet. It is on the eastern shore of the Little Grass Valley Reservoir, which was formed by flooding in the 1960s. The campground and the lake are surrounded by thick stands of pine and fir trees. There are multiple campgrounds located around the lake as well as cabins on the south side. The campground is also the center of a popular snowmobiling area during winter months. 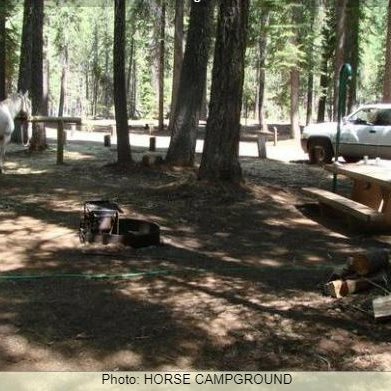 The campground offers about 10, single-family, equestrian campsites, available for tent and RV camping. Hookups are not available and the parking surfaces are gravel. Lantern posts and hitching racks are provided at each site. Each site is also equipped with a table and a campfire ring with a grill. Accessible vault toilets are provided. An on-site host may be available. About 12 miles northeast of the lake lies a small, natural lily pond, called Fowler Lake. It sits at an altitude of 5,446 feet and is a beautiful sight.